Created by Adobe Systems, PDF (Portable Document Format) can be considered as one of the popular formats used either for personal or commercial purposes when it comes to distributing documents over the net. PDF files will maintain the information’s integrity. It maintains the exact look of the original documents and preserves the source of information. Once you have converted your document to PDF format, you will worry less that the documents you send out to other people will be forged. Since there are so many advantages in using the PDF file, how do you create or convert your document to PDF format? Of course, the ideal way is to buy the Adobe Acrobat software and make the conversion. But it costs you money and it can be quite expensive. Adobe does offer affordable online service to convert documents to PDF at US$9.99 per month or US$99.99 per year. However, this service is only offered to Canada and USA users. Nevertheless, if you want to use the service and yet don’t want to spend money, there are a few methods on how to convert document to PDF files for free for your reference. You can use OpenOffice.org (OO.o or OOo), the free office suite application by Sun Microsystems to do so. The OpenOffice.org has offered users the option of distributing their documents in a non-editable format via PDF since its early release, Version 1.1. Users who like to try out OpenOffice.org can download the latest version OpenOffice.org 2.3.0 via the download link here. PDF online allows you to make the conversion from its webpage. What you need to do is to browse for your document, name it and type in your email address. 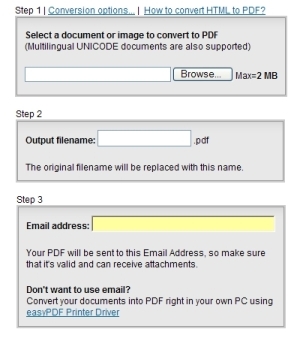 The PDFOnline will thence convert your file to PDF format and email it to you once it is converted. The disadvantage of this service is the service provider only allows you to convert documents or images with less than 2MB capacity. PrimoOnline is another free online conversion to PDF program which works quite similarly to PDFOnline except it doesn’t limit you document’s conversion size. Conversion will be done in three simple steps: 1. Enter your email address for receiving your converted file; 2. Browse the file that you want to convert; 3. Click “Get” to complete the process. The conversion processes for both PDFOnline and PrimoOnline are pretty straight forward. These two services are free and quite reliable. However, the great disadvantage for this free service is security concerns. You can’t protect your documents with passwords. Besides, you might not be comfortable uploading your important and highly sensitive documents onto these online service providers. There are also other free services available on the net such as doc2pdf, neevia and etc that you can try. The working concept basically is quite similar. Besides Adobe Acrobat, there are various softwares which are able to create PDF files. PrimoPDF and CutePDF are amongst the free conversion software. Both PrimoPDF and CutePDF can be downloaded from the respective websites for free. They feature a user-friendly interface and support Windows Vista. Download link for CutePDF and PrimoPDF. Another method to do conversion to PDF file is via Microsoft Office’s Add in. Download from Microsoft (OGA validation required or you can direct download the PDF add-ons here. See also guide on using Office 2007 to save PDF documents). and upgrade your Microsoft office package. With the new Microsoft Office Add-in, you can save all the Microsoft Office file extensions in PDF Format. You can use not only MS Office as PDF Creator but also as PDF Converter from other Office File formats by using the ‘Save As‘ option.